As some of you who read my blog are aware, not long ago I was a PhD student at Nazarene Theological College (accredited by The University of Manchester) in the United Kingdom. I wrote about the decision to step back from that pursuit in this post from August of 2012. What I didn’t share in that post but what has become clear since then is that there has been a transition in my research interests of a Wesleyan doctrine of the atonement from an historical quest to more of an investigation of the doctrine and its implication for the contemporary audience. In other words, I’ve been drawn to wrestle with this question: “What would a Wesleyan theology of the atonement look like in the church?” I think this transition has been quite natural given the shift in my vocational path from the classroom to the pulpit. Several people in the churches I am serving have been made aware of this shift and of my continued interest in the subject. So when a couple from Liberty UMC went with Carrie and me to the opening weekend of the Generative Leadership Academy, and we were challenged to do some sort of Lenten project, they asked me about the possibility of my leading a study on the atonement during the Lenten season. It seemed like an ideal time to talk about such a topic. Lent is about the journey to the cross. Jesus’ sacrificial death there is at the heart of what we mean when we talk about the atonement. Sure, let’s do this! In my mind (and in my saved files) I had a structure in mind for how the study might go if we broke it up into a weekly study, so we began making plans on making this idea a reality. We talked about the nature of Lent, how it is a season of ‘fasting’ for 40 days, excepting Sundays which are days when most observers of Lent are encouraged or at least permitted to ‘break’ their fast (otherwise the fast is 46 days, in total). And as you can easily discern, the meaning of the word that describes our first meal of the day is derived from this very sort of practice (break-fast). So we thought an ideal pairing would be to have a breakfast meal before each session of the study. The trouble is, however, that Sunday morning breakfasts at Liberty UMC are not feasible as the first worship service I lead is at the other church to which I am appointed, Post Oak UMC. So we talked about other days when a breakfast meal would provide an opportunity for people to participate in the study. That’s how we arrived at Saturdays, when most people are off work, and we wouldn’t have to make it too early (we’re set to begin at 9:30am each week). I’m really excited about this study and it seems to have garnered a good deal of interest from lots of people in the church as the sign-up list has grown over the weeks that we have announced it, and I’m aware of neighboring churches advertising it and that we’ll have outside participation as well. My hope is that we as United Methodists can discover how this central doctrine to our faith is related to the rest of it and how the atonement in Christ can be seen as the shape of how God’s grace is made known in the world and in our lives. 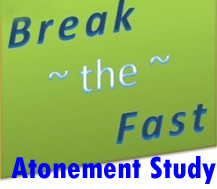 So if you are anywhere near Camden and have an interest in the doctrine of the atonement can be seen through the lens of Wesleyan/United Methodist way of being a follower of the Christ, or if you just like to eat breakfast with other people, I encourage you to join us on Saturdays in Lent at Liberty UMC at 9:30am. The first breakfast (March 8) will begin in the Wrather auditorium, which will require your entrance through the sanctuary. (We’ll have signs and people pointing the way.) The remaining breakfasts will be served in the fellowship hall. All of the sessions for the study itself will be in the sanctuary. Come and join us! (If you’re not able to join us, I plan on sharing highlights here when possible.) The address for Liberty UMC: 3135 Highway 69A, Camden, TN 38320. May God guide us in our quest this Lenten season as we journey to the cross!